It’s better to give than to receive at Christmas, right? Well, here’s a way you can do both! This is how it works. You give ten dollars to uber store Baby’s Got Style, you receive a spectacular kids’ designer plate, and they give your money straight to The Children’s Hospital at Westmead. Yep, that’s right. The whole ten bucks! So you can make a difference this Christmas and help a worthy cause while picking up a rather useful stocking filler. It’s all part of ‘Style A Smile’, a fantastic Christmas campaign from Baby’s Got Style, which sees two of Australia’s top kids labels Oobi and Minti each design a dinner plate and every cent from every charity plate sale goes directly to The Children’s Hospital. The Minti plate is awesome – who’d have thought a hot dog could ride a skateboard? Then there’s the Oobi plate showcasing a myriad of signature citrus coloured spots and apples, it’s definitely a visual feast! 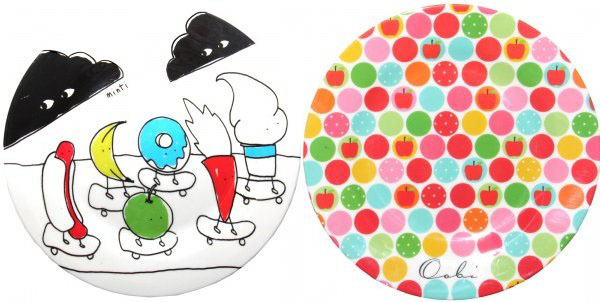 Made from melamine, these generous-sized plates are perfect for kids of all ages. At only $10 per plate not only are you buying a useful and practical stocking filler, you’re also helping channel much needed funds to The Children’s Hospital at Westmead. ‘Style A Smile’ Plates are sold exclusively through Baby’s Got Style and they’ll deliver them to your door in time for Christmas!